We talk to illustrator Dave Perillo in the latest installment of our series of occasional bonus episodes featuring interviews with subjects we think will interest you. Dave is a Philadelphia-based artists whose work has been featured on retro-styled merchandise for Disney with a focus on attraction artwork. 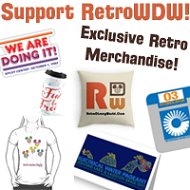 Welcome to a special episode of the Retro Disney World Podcast! We talk to illustrator Dave Perillo in the latest installment of our series of occasional bonus episodes featuring interviews with subjects we think will interest you. Dave is a Philadelphia-based artists whose work has been featured on retro-styled merchandise for Disney with a focus on attraction artwork. He will be appearing this weekend at Disney Springs in the Wonderground Gallery section of the Marketplace Co-Op store. Dave shares stories of his history with Disney parks and how his love of Mr. Toad’s Wild Ride has influenced some of the merchandise you’ve been able to purchase over the years. Dave’s artwork runs the spectrum of pop culture interests. If there’s a fan community out there for pop culture media there’s a good bet Dave has done some artwork that will be of interest to you. Star Wars, Airplane!, Disney, The Simpsons, classic cartoons and advertising — you name it. Dave’s whimsical artwork and Mary Blair-influenced style is sure to delight and amuse. Listen to our interview and follow Dave on Twitter and Instagram @montygog. Dave will be at Disney Springs at the Marketplace Co-Op this weekend October 21st and 22nd from 5 PM – 8 PM and on Sunday October 23rd from Noon to 3 PM. Check back with us very soon for Episode 24 where we take you to The Golf Resort in honor of our old buddy, Arnold Palmer.